Humkara (Skt. Hūṃkāra; Tib. ཧཱུྃ་ཀ་ར་, ཧཱུྃ་མཛད་, Wyl. hUM ka ra or hUM mdzad) — one of the eight vidyadharas of India; he received the Shri Heruka (Tib. Yangdak Heruka) tantra from the Kagyé cycle. According to the Pema Kathang, Humkara’s home-country is the mythical country of Ngatubchen (Wyl. rnga thub chen). There, Humkara was initiated into the Kagye—the Nyingma’s eight main yidam which includes Shri Heruka—from Padmasambhava and his consort Kalasiddhi. Taranatha suggests that Humkara may have been an epithet of the siddha Vaidyapada (Skt. Vaidyapāda; Wyl. sman zhabs) aka Viryapada (Skt. Vīryapāda; Wyl. bhi rgya pa, bir ya pa, bha wa pa). Accordingly, Vaidyapada received the epithet Humkara after he had practised and accomplished the wrathful deity named Humkara. The short biography of Vaidyapada that Taranatha relates, matches the biography that Dudjom Rinpoche gives of Humkara. From this, it appears as though Dudjom Rinpoche also believed Humkara to be Vaidyapada. Dudjom Rinpoche however never mentions the name Vaidyapada or Viryapada and only refers to the siddha as Humkara. Following Dudjom Rinpoche’s and Taranatha’s hagiographies, Humkara was born into a Brahmin family in ancient Nepal (i.e. the Kathmandu valley) and thus first became learned in the bhramanical tradition. He was ordained at Nalanda and studied with the masters Buddhajnanapada and Dipamkarabhadra (Skt. Dīpaṃkarabhadra) or Rahulabhadra (Skt. Rāhulabhadra). By practising it together with an ‘untouchable’ (Skt. caṇḍāla) consort, Humkara gained the accomplishment of the mahamudra vidyadhara. It is ambiguous whether Humkara either attained this accomplishment through the practice of Shri Heruka or revealed the practice of Shri Heruka as a result of his accomplishment. Humkara is said to have been the teacher of Avadhuti (Skt.) of Kamaru (Skt. Kāmarū), Vajrasana (Skt. Vajrāsana), Kusali and Buddhashrishanti (Skt. Buddhaśrīśānti) of Uddiyana. These are said to have taught in turn Sauripada (Skt. Sauripāda) and Abhayakaragupta. In the Nyingma tradition Humkara is also listed as one of the teachers of Dhanasamskrita. If Humkara taught his students the practice of Shri Heruka, then the students mentioned above constitute the Indian tradition of Shri Heruka. According to the Nyingma terma tradition, Humkara is counted as one of a mandala of eight vidyadharas who revealed the Kagyé in the Shitavana charnel ground at the Shankarakuta stupa. As a result of their practice the vidyadharas had a visionary encounter with the dakini Karmendrani and were each entrusted one yidam by her. Humkara received the teachings on Shri Heruka. Thus, Humkara is said to have held both an oral and a revealed lineage of Shri Heruka, which according to Dudjom Rinpoche, he transmitted to his main disciples Padmasambhava and Namkhé Nyingpo. Later, Humkara is said to have travelled to Tibet where he served as the chaplain of King Senalek. Hence, Tibetan lineage of Shri Heruka could be traced back to Humkara’s teachings giving during his stay in Tibet and especially to his disciples Padmasambhava and Namkhé Nyingpo. 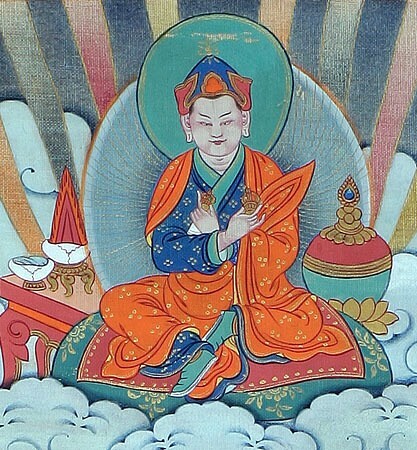 Regarding Humkara’s writings, the Tengyur preserves in total five texts attributed to him. All of them are classified as ritual manuals of the Sarvabuddhasamayoga (D 1674-78) and three of them are dedicated to a deity referred to as Shri Heruka (Wyl. dpal he ru ka, D 1674, 1675 & 1678). Regarding the Tengyur texts; D 1674 & 1677 were translated by Vidyakarasimha (Skt. Vidyākarasiṃha) and Lha Rinpoche. D 1675 & 1676 were translated by Vajrahasa (Skt. Vajrahāsa) and Ma Rinchen Chok. The colophon of D 1676 states that the text was translated in the Samye Chimphu caves on the request of the Bodhisattva King. The fifth ritual manual, D 1678 according to the colophon, was translated on the orders of King Trisong Deutsen, by Namkhé Nyingpo together with Humkara at Nalanda. The Nyingma Gyübum attributes the tantra dedicated to Shri Heruka, entitled Pal Heruké Tukyi Gyü Galpo (Tib. Pal he ru ka’I thugs kyi rgyud gal po) to Humkara. According to the colophon, the tantra was revealed by Humkara from Uddiyana and in turn translated by Padmasambhava and Namkhé Nyingpo. Additionally, Dudjom Rinpoche states that Humkara authored the Shri Rulu Golden Rosary (Tib. Yang dag ru lu gser phreng). However except for further references to this text, which Humkara is said to have transmitted to Namkhé Nyingpo, the actual text appears to have disappeared. Furthermore, Erberto Lo Bue mentions two further works attributed to Humkara and translated during the first diffusion of Buddhism to Tibet, namely Gyadün Drel (Tib. Rgya mdun ’grel) and Dodrel Naljorpé Drömé (Tib. Mdo ’grel rnal ’byor pa’i sgron me). However, the actual texts appear to have disappeared. If we also consider Taranatha’s identification of Humkara with Vaidyapada then there is a further commentary on Guhyasamaja preserved in the Tengyur that could be attributed to Humkara, namely the Samyakvidyakara (D 1850, Skt. Samyakvidyākara, Tib. Yang dag rig byed). According to the colophon this work was translated by the pandita Kamalaguhya and the Tibetan translator Yeshé Gyaltsen (Tib. Ye shes rgyal mtshan). ↑ Yeshe, Tsogyal, The Life and Liberation of Padmasambhava, Vol. I & II, (Emeryville: Dharma Publishing, 1978): 300-302. ↑ Most of the hagiographies state that Humkara is the master obtained after having displayed great advancement in his meditation practice. ↑ For the account by Tāranātha, see: Taranatha, The Seven Instruction Lineages (bka' babs bdun ldan), translated by David Templeman, (Library of Tibetan Works and Archives: Dharamsala 1983): 62-63. And, for Dudjom Rinpoche’s account, see: Dudjom Rinpoche, The Nyingma School of Tibetan Buddhism: Its Fundamentals and History (Somerville, MA: Wisdom Publications, 1991): 475-457. ↑ Dudjom Rinpoche states that Humkara studied with Buddhajnanapada and Rahulabhadra. Taranatha states that he studied with Buddhajnanapada and Dipamkarabhadra. ↑ Taranatha, see: Taranatha, The Seven Instruction Lineages (Bka' babs bdun ldan), translated by David Templeman, (Library of Tibetan Works and Archives: Dharamsala 1983): 63. ↑ Erberto Lo Bue, “The Role of Newar Scholars in Transmitting the Indian Buddhist Heritage to Tibet,” In Les habitants du toit du monde. Hommage ά Alexander W. Macdonald, (Nanterre: Société d’ethnologie, 1997): 632. ↑ Here vidyadhara refers to a practitioner who has gained magical abilities through his or her accomplishment in tantric practices. ↑ Dudjom Rinpoche, The Nyingma School of Tibetan Buddhism: Its Fundamentals and History, (Somerville, MA: Wisdom Publications, 1991): 482-483. ↑ Taranatha, The Seven Instruction Lineages (Tib. Bka' babs bdun ldan), translated by David Templeman, (Library of Tibetan Works and Archives: Dharamsala 1983): 63. ↑ Vidyākarasiṃha worked on more than 20 Kangyur and Tengur translations with various Tibetan translators. Among them are Jñānasena (Skt. Tib. Ye shes sde) and Manjusrivaram (Skt. Mañjusrīvaram), Kawa Paltsek (Wyl. Ska ba dpal brtsegs), and Khön Lui Wangpo (Tib. Khon klu’i dbang po srung ba). ↑ This could likely have been a vision of Uddiyana. ↑ Dudjom Rinpoche, The Nyingma School of Tibetan Buddhism: Its Fundamentals and History, (Somerville, MA: Wisdom Publications, 1991): 467-468. Germano, David. “The Seven Descents and the Early History of Rnying ma Transmissions.” The Many Canons of Tibetan Buddhism. PIATS 2000: Tibetan Studies: Proceedings of the Ninth Seminar of the International Association for Tibetan Studies, Leiden 2000: 225-263.